In an indication of Russia’s growing strength, Forbes has announced that there are now 110 Russian billionaires. Last year, there were only 60 billionaires in Russia but growing economic strength, combined with a weakening dollar has almost doubled the numbers of Russia’s most exclusive club. Today, only the United States has more billionaires than Russia. Whose star is rising, whose star is falling? 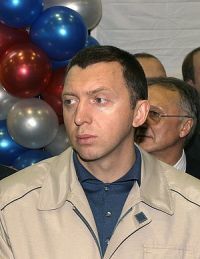 Oleg Deripaska, boss of Aluminium producer Rusal remains at the top of the rich list. He’s worth $28.6bn – that’s $7.4bn more than this time last year. Doesn’t he look happy? If you thought that was a big gain, check out steel tycoon Alexei Mordashov. The second richest man in Russia is today worth $24.5 billion – he’s worth twice as much as he was last year, when he had a mere $12 billion to his name. In third place, continuing his graceful slide down Russia’s rich list is Roman Abramovich, the most famous of Russia’s oligarchs. Two years ago, the owner of Chelsea football club was Russia’s richest man but, despite another pretty hefty increase in his fortune this year, the oil magnate doesn’t seem able to keep pace with the tigerish metal oligarchs. He’s worth only $24.3 billion. So, is all this money from oil and gas, or what? If you listen to the popular press, Russia’s renewed economic might is all down to oil and gas. But if you take a good look at the list of billionaires and you’ll see that most of Russia’s richest men are involved in extracting other mineral resources – nickel, iron, steel, etc. Perhaps not entirely positive – after all if Russia keeps digging all its wealth out of the ground its going to end up with a country built on very shaky foundations. But still, it’s easy to fall into the widely promoted trap that Russia’s recent wealth has been built on oil and gas, whereas this simply is not the case. And what about Putin? Is he secretly Russia’s richest man? Remember the stories from a couple of months ago about Vladimir Putin alleged $40 billion fortune? Well, he’s not made it onto the Russian Rich List, so Forbes clearly don’t think the story is accurate. (As an aside – does anyone know what incoming President Dmitry Medvedev is worth? Either officially or straight off the rumour mill…). well, it might take some 1500 years and a population of one or two billions to do that, but I guess you’re right :-P.
What Russia needs is not preachers, but free immigration, a low barrier for entry in business and access to the world market: Peter I had that right. So much for the Old Believers. How far Russia has strayed from socialist and collectivist principles. The Super rich has mopped up the wealth of the country. Putin has done a better job than Yeltsin in putting all the country’s wealth into the hands of an elite few. None of these guys deserve it. They are crooks. In my estimation, those oligarchs should be rounded up and their fortunes divided amongst the people. Let’s divide $552 billion dollars by 45 million russian households = $11,600. That would go along way to alleviating poverty in Russia. Levelling the wealth disparity in other countries can do wonders as well. Plenty of “crooks” to be found elsewhere. As for Russia, the existing circumstances lead some to conlcude that Putin doesn’t have as much clout as others suggest. Next story Want to use Wi-Fi in Russia? Don’t forget your permit!